Lost Island Lake - The lake is the 6th largest natural lake in Iowa. Summer is fun for all ages, whether it's swimming at the beach, boating, camping, fishing or simply enjoying the walking trails or park. 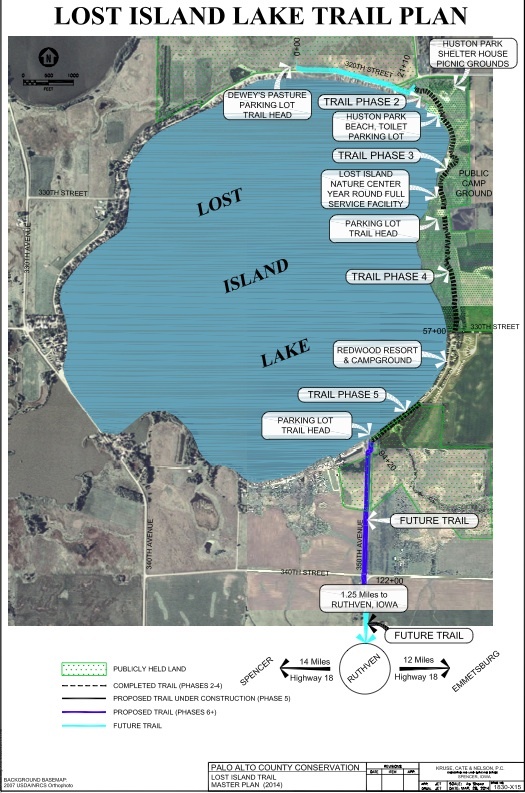 Lost Island Trail - Phase 4 of the trail has been completed. The Trail is designed for pedestrian and bicycle traffic. Map of Trail and phases. Lost Island Prairie Wetland Nature Center - The Palo Alto Conversation Board offers educational programs and organized events at the Nature Center and at the lake throughout the year. Okoboji - Want a change of pace? Okoboji offers great entertainment and nightlife and is only 27 miles from Redwood Campground. Arnolds Park is an area landmark with more than 30 rides and attractions for all ages. Spencer - It's a short 17 mile drive to Spencer. The town of Spencer offers many entertainment and dining opportunities to enhance your Redwood Resort stay. Golf - Emmetsburg, Spencer and Okoboji all have golf courses for the golf enthusiasts.